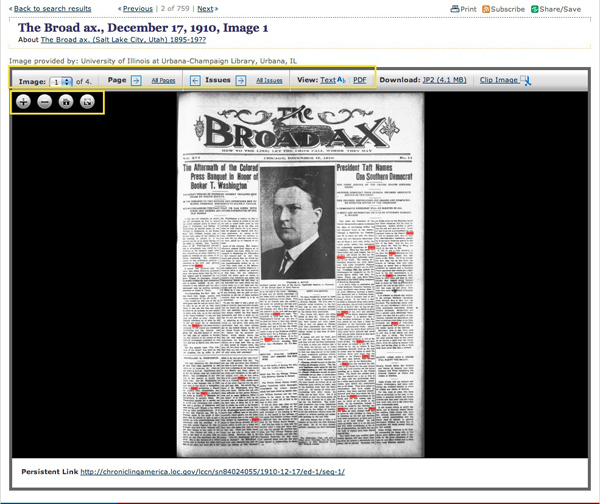 Below are directions for viewing and saving articles and other useful sources from historic newspapers found in the Chronicling America Historic American Newspapers collection (for search tips, see link at the bottom of this post). Click the image or the item title to view the item. Use the gray icon buttons to view the selected result. The + icon button zooms into the item. The – icon button zooms out of the item. You may also zoom in and out using the scroll feature, if available, of your mouse or track pad (NOTE: the pinch and zoom feature on tablets does not work; to zoom in and out on a tablet, you must use the icon buttons). The house icon button brings you back to the initial item view. The divided square icon button allows you to toggle between the initial item view and a full-page item view. 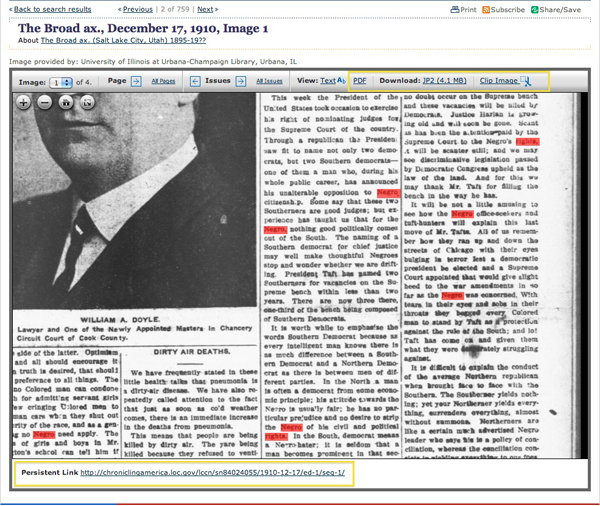 Click the View: Text link to view the text of an item generated by OCR (Optical Character Recognition); please note there may be irregularities or errors in this version as it is automatically generated. Click the Clip Image link to access a page from which you can save the current image as a .pdf document (click the print image link) or a .jpg image file (click the download image link); NOTE: this option is available from the initial view as well as from a zoomed view. View other pages in this issue (use the Image: drop-down menu, the Page arrow button or the All Pages link). 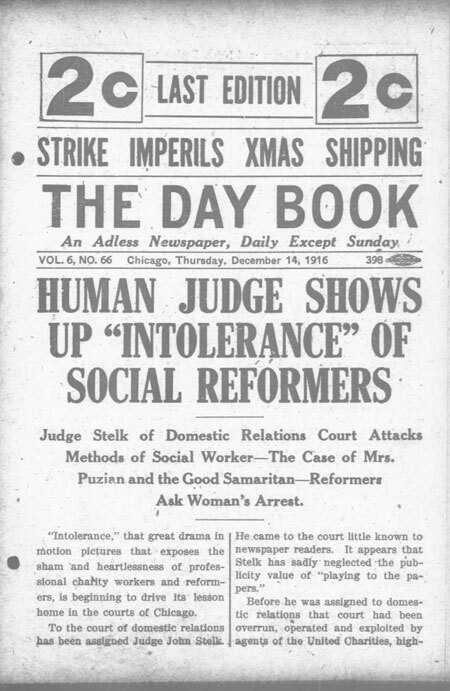 View other issues from this newspaper (click an Issue arrow button to view the previous or subsequent issue or the All Issues link). Right click on the View: PDF link to save a copy of the file. Click the Download: JP2 link to download a high-resolution image of the item but please note that you may need special software to view this type of file. Click the Persistent Link URL at the bottom of the item to save or bookmark the web page for this item.